Dabble in startups, engineering, product and data. Over the years I've made several attempts to teach/share know how: tutorials, forums, IRC channels, stackoverflow, contributing to other projects - but nothing particularly scalable or sustainable. Eventually got around to the realisation that a more impactful approach was to enable others to teach instead. I'm a bad teacher anyway, I'm slightly better at building things. 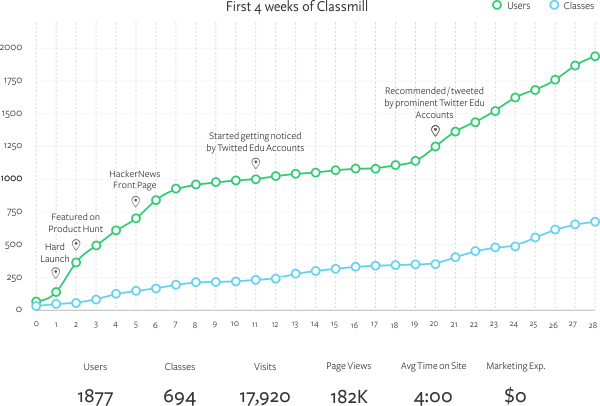 A product spec, some prototypes, wireframes, and an MVP later - Classmill was out the door. I'll attempt to outline the thinking behind it and where it is now..
Getting to the first 2k users was faster / easier than I thought. Why? it seems people wanted this product. This was exhilarating. I've had reasonable successes with side projects before, but nowhere close to the adoption/evangelism Classmill is enjoying. I explored many avenues to take this to the next level: build a company, close VC funding, open sourcing, collaboration, partnering with an institution - but it made more sense to let it grow on its own. There are inbound institutional partnership options on standby, however. Most other options have its fate ending up as yet another Udemy; a cesspool of poor content parading as education on perpetual discounts. There are classes in 14 languages on the platform. 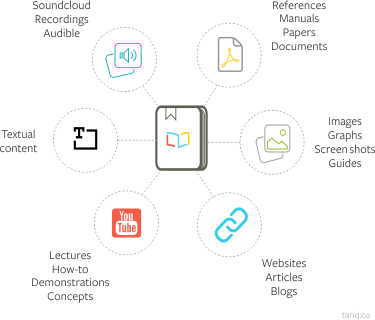 People have voluntarily tweeted, shared, presented it at teacher conferences, recorded tutorials (also in Japanese, Russian and Spanish!) and run workshops on how to use it. Teachers are not exactly the ideal early adopters of new technology/methods and the education industry is notorious for requiring all sorts of admin, institution and regulatory approval. Lesson learnt: teachers will do absolutely anything that'll make their students lives easier/better. 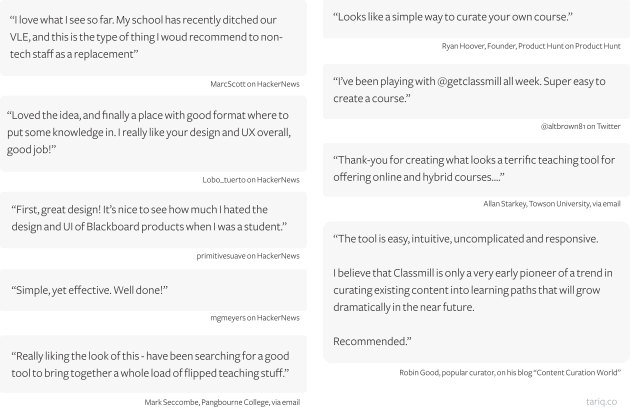 The main reason Classmill has been growing is that teachers love it - and they talk about it to other teachers. 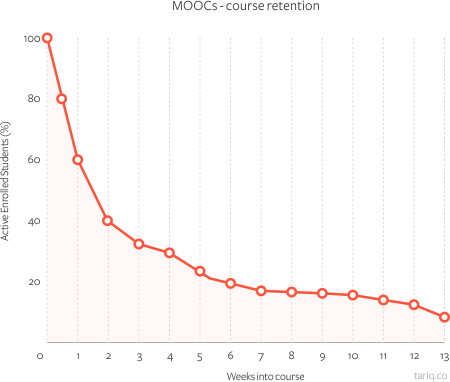 Stats: 3x growth in modules created (a stronger metric for an active class - there are thousands of empty classes) and 5x growth in module engagement in the last 3 months. 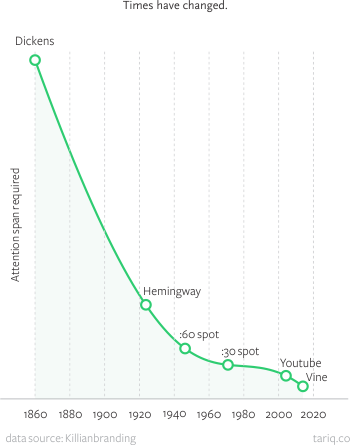 Strangely public shares and recommendations have reduced, but registrations and enrollments are at an all time high. I'm not convinced by the commercial and missionary approaches taken by others in the same space - I will steer it in a stronger direction once I have conviction that it is the right thing to do for the thousands of teachers and students using the platform as it is today. I'll expand more on this post in the near future with more detail, but if you'd like to know more, or have thoughts to share, please write or tweet to me.